could phineas and ferb have a ride at a disney park ? Could a Phineas and Ferb ride ever show up at a Disney park ? I think it would work well at Epcot. 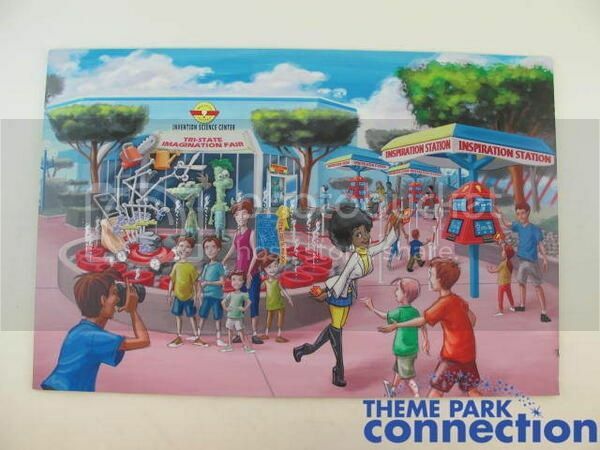 There was at one point a plan to do something with them at Imagination...But, it's mostly the outside area...Here's the concept art...There was nothing else about a ride or what they would have done for the magic eye theater.. I answered yes since disney owns the rights to phin and ferb. I super highly doubt it but I love Phineas and Ferb though and my ringtone even used to be There's A Platypus Controlling Me. The show is cancelled, personally I think making attractions based off TV shows is a bad idea. The exception being if the TV show in question is highly iconic (ie: I love Lucy, Twilight Zone, etc). Phineas and Ferb are no longer on the air, and while they are getting a new movie on Disney+ I don't see them reaching the popularity they once had. I think a lot you fans need to realize that Disney likes to pick IPs that are relevant, profitable, and marketable. They do not care how much you love it, it's how much the general public loves it. P&F is old news and the time to capitalize on it in the parks has long since past. I love Phineas and Ferb! My sons even have the ear hats and got them signed by both of them at Hollywood Studios. They wear them occasionally and always get stopped by people asking where they can buy one. Sadly, no more. We bought the talking Perry a few years ago at HS and now I notice they are not available anymore. My grand nieces and nephews love them so I think it could work. I don't see it happening. While they were popular when they were on, they're no longer airing the cartoon and it's popularity is dying. It also didn't have a huge spectrum of ages and people that it reached- no where near on the same level as a theatrical release. It won't show up for the same reason a Hannah Montana or Wizard's of Waverly Place ride won't show up. Wow that looks so awesome ! I really hope Disney does this ! I disagree, I think Disney plus will grow out Phineas and Ferb's popluarity. But you never know. I think the IP has the potential to be timeless. Plus the show still does reruns and is still extremely popular among kids.